Kill the beast. Win the girl. A strange beast stirs fear in the kingdom of Lochlanach, terrorizing towns with its brutality and hunger. In an act of desperation, a proclamation is sent to all of Eurona—kill the creature and win the ultimate prize: the daughter of King Lochson’s hand in marriage. Princess Aerity understands her duty to the kingdom though it pains her to imagine marrying a stranger. It would be foolish to set her sights on any particular man in the great hunt, but when a brooding local hunter, Paxton Seabolt, catches her attention, there’s no denying the unspoken lure between them…or his mysterious resentment. Paxton is not keen on marriage. Nor does he care much for spoiled royals and their arcane laws. He’s determined to keep his focus on the task at hand—ridding the kingdom of the beast and protecting his family—yet Princess Aerity continues to challenge his notions with her unpredictability and charm. But as past secrets collide with present desires, dire choices threaten everything Paxton holds dear. Inspired by the Grimm Brothers’ tale, “The Singing Bone,” New York Times bestselling author Wendy Higgins delivers a dark fantasy filled with rugged hunters, romantic tension, outlawed magic, and a princess willing to risk all to save her people. I loved the Sweet series by Wendy Higgins. LOVED. So I knew I needed this book pronto. I’m not familiar with “The Singing Bone”, but now I need to read it to learn more about this tale! For a while there, I felt like it would never be going anywhere. It was monotonous castle life on every page, unless it was a POV of one of the Lashed. And I am glad for those alternating chapters, because I probably wouldn’t have stuck around had it been Aerity’s world all the time. I’m usually not a fan of the third person POV, but I didn’t mind it here. And once the story picked up, I was hooked. I fell in love with the charming kingdom of Lochlanach and all its residents (especially the hunters). The Lashed are my new favorite creatures. I’m incredibly intrigued. I loved Aerity instantly and adored Vixie just as much. What a cute little family! The Seabolt brothers. Paxton and Tiern are the perfect opposites and I loved their bond and what family meant to them. To choose family over honor or glory is a trait held by few. As always, Wendy Higgins crafted a highly dramatic tale, beautifully written and completely surprising. Once The Great Hunt finally got going, I couldn’t stop and quickly finished it. A consuming read full of twists and turns, romance and deception. The Great Hunt has it all...secrets, magic, royalty, betrayal, romance, and evil. Overwhelmed, she turned and gathered her skirts, forcing her chin to remain up as she walked steadily from the High Hall." Where do I start? Wendy Higgins is by far one of my most favorite authors that I have ever read. Her writing is beautiful, intricate, and holds my attention until the last page. Every book that she has ever written has just been phenomenal. I open the first page and literally cannot put the book down until the very last page. Another thing that makes me love Wendy Higgins so much is that she is all about her fans! She is a hands-on author that responds to reader questions and keeps in touch with all her fans thru her fan pages. I have such high respect for authors that show love to their fans!!! So when I saw that Wendy was coming out with a new duology....I literally screamed I was so happy!! and that cover??? I mean seriously?? What a perfect cover to reflect a high fantasy themed story. Absolutely love it. 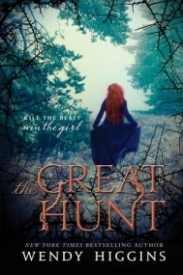 The Great Hunt is a high fantasy story with intense action scenes, swoon-worthy romance, and spell-binding magic intertwined into this exceptional story about a kingdom being attacked by a great beast that cannot be killed. The king of the lands has almost given up all hope of the beast being killed until he decides to offer a proclamation that whichever hunter kills the beast....will get the hand of his eldest daughter in marriage. Hunters come from all over to compete and kill the beast and win the hand of the beautiful Princess Aerity. sharp teeth shining. Its beady eyes eerily caught the moon's reflection. Everything about its stance and posture screamed feral. Deadly. Impossible." One of my favorite parts about this book is that the story does not solely focus on one or two characters but yet several relationships are forming and they are all equally fascinating and mesmerizing. Although there are several relationships building within this story....Paxton and Aerity are my favorite. Aerity is so innocent and full of heart and love ....and Paxton has such a rough exterior with a protected heart and will let no one in. I absolutely loved the world-building..... the lush forests and surrounding waters that made me think of Ireland in the times of Kings and Queens. The Great Hunt is such a fascinating story filled with magic and breath-taking romance. There are people throughout the kingdom whom are called "the Lashed" because they have magical powers which make them dangerous in the eyes of the King. The people of the kingdom that are "lashed" have to keep themselves secret in order to live within the kingdom and not be exiled. The Great Hunt has it all......secrets, magic, royalty, betrayal, romance, and evil. I was completely and utterly obsessed with this book from the first page to the last. Wendy Higgins writing is so enthralling and beautifully written that I felt as though I was in the book living each moment with these fascinating characters!!! I cannot wait to get my hands on the conclusion and get all the answers to my questions!!!! Where did this Beast come from? Who will kill him and win the Princess's hand? What are the secrets behind the mystery of the beast? Who will truly win Aerity's heart? When a beast starts attacking people in the Kingdom of Eurona, a declaration is sent to all its citizens. Join the hunt, kill the beast, marry the princess. Princess Aerity always thought she would marry for love but she knows her duty to the kingdom and will abide by her father’s decision if it means the beast is killed. With the hunt being so dangerous and with so many men, she would be foolish to focus on just one, but Paxton Seabolt catches her eye. Paxton cares nothing for marriage, or for the royal family, but joined the hunt for the challenge and to stop the beast. He never expects for Princess Aerity to be so different than he thought. As more men fall to the beast, Paxton’s biggest secret threatens to be revealed, a secret that would not only take him out of the hunt, but it would mean his life. This book started off with a huge bang straight away and I ended up getting sucked in so easily and so quickly. It slowed down almost immediately after, giving enough time to introduce the characters and some world building before quickening back up. The whole concept was intriguing and I was excited to see which, if any, hunter would kill the beast. I know who I was rooting for and who I would be alright with, and who I definitely didn’t want to succeed. I really liked Princess Aerity’s character. She was strong and willing to do whatever was necessary of her, whether that meant minding and distracting the younger kids of the royal family or marrying a total stranger. She was very open-minded about the people the kingdom called Lashed Ones, magic-users. I liked that she was willing to judge a person on who they were and what they did instead of going by the same beliefs as everyone else. Her interactions with other characters were great, from Paxton to Paxton’s brother, to her cousin ,Wyneth, and her sister, Vixie. It was easy to tell her family bonds were strong and she would be protective of anyone she cared about. Paxton was also a great character. I loved his relationship with his brother, Tiern, and how he was always trying to both protect him during the hunt and try not to undermine or embarrass him in front of the other hunters. He was definitely more of the silent, brooding type than his open, friendly little brother, but no less caring of those he loved. I have never read ‘The Singing Bone’ but this book made me want to track down the original. There was a lot of action during the hunting scenes and I enjoyed that they were off-set by scenes of Aerity interacting with the hunters to keep their spirits up and having fun. The transition between the tense scenes and the more light-hearted scenes were well done and it didn’t feel jarring at all. It was smooth. The romance was a slow one that I enjoyed. There was fascination between the two pretty quickly but that I could understand. Neither of them acted in a fashion the other was expecting so it made sense that it would draw the curiosity of the other. They could admit they found the other good-looking without needing to declare they were instantly in love. It was nice and it left room for Aerity to still interact with the other hunters instead of wanting to only talk to and think about Paxton all the time. It was a great book on its one but I am glad there’s a sequel coming because I really need to know what’s going to happen with these characters.